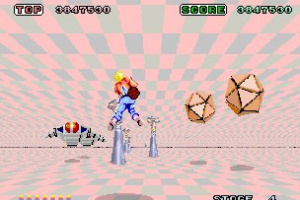 An interesting slice of gaming history for fans of early 3D games. 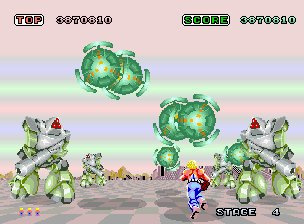 Space Harrier is a rail shooter game, released by Sega in 1985. 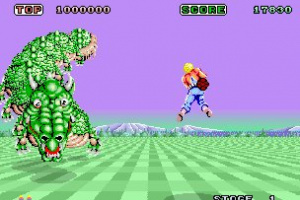 It was produced by Yu Suzuki, the man responsible for many popular Sega games. 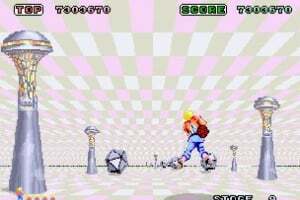 It is set in "the Fantasy Zone", a surreal world composed of bright colors and a checkerboard-styled ground. 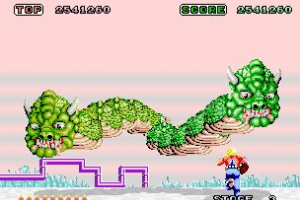 The enemies are also unique, featuring prehistoric animals, Chinese dragons, and alien pods. 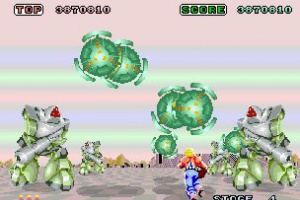 The player is forced along the levels, running or flying around enemy fire, while shooting back with fireballs via the character's under-arm cannon (which doubles as a rocket-esque device allowing the character to fly). 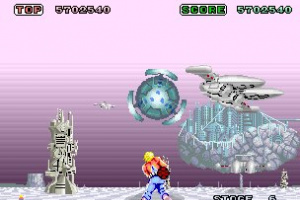 The character graphics are sprite-based, though the level backgrounds are faux 3D. 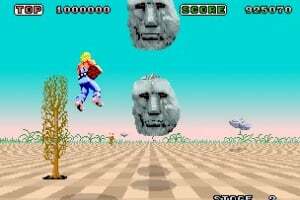 I might down load this! So getting this when it comes to NA. 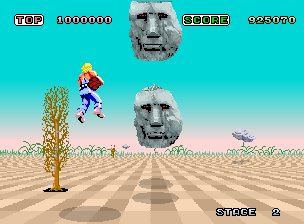 Been waiting eagerly to give it a go. 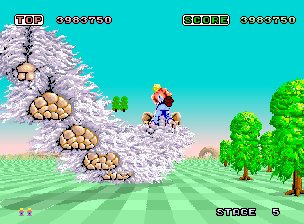 It's hard to believe that in 3 short years Sege went from Zaxxon (which is also awesome) to Space Harrier. 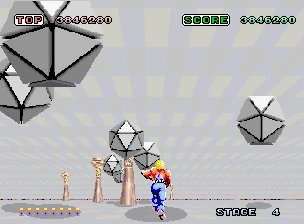 They both sported the best pseudo 3d graphics of their era. 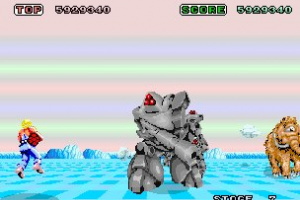 I'm predicting a release in North America sometime in June 2009. 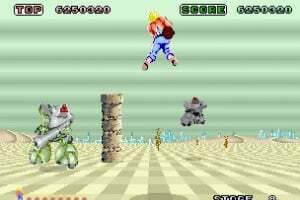 Maybe it will be for 500 Nintendo points because of arcade popularity in the region. 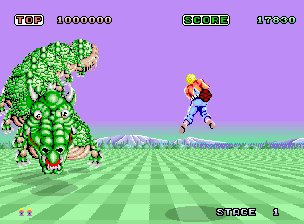 I freaking love Space Harrier! 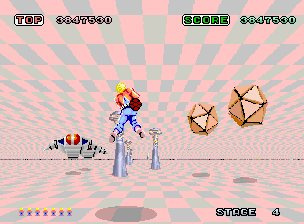 I'm going to wait for the review though, I want full Analog control support just like the arcade did, ok it wasn't full 360 degree movement, it was something like 32 or 16 directions. 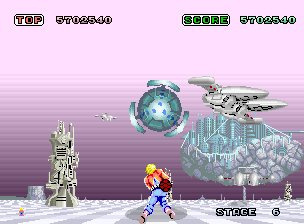 If the Analog sticks just act as a virtual 8 way joystick I'll just stick to The Ultimate MegaDrive Collection version. 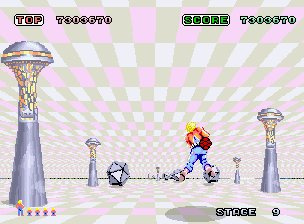 This game is trippy as hell and the main theme is, well, legendary. 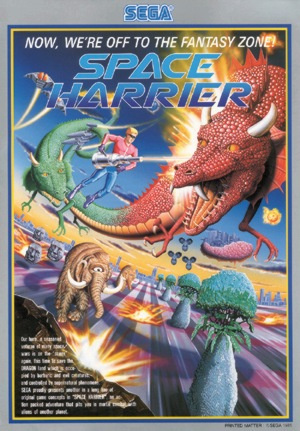 I think I might be approaching owning enough versions of Space Harrier to pass this one up. 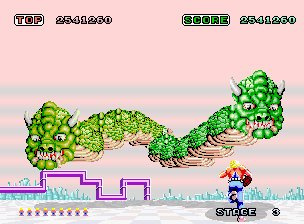 You'd rather have crappy ports than the arcade original? is the US getting this?? Yep. We finally got it today! Who in there right mind would buy this? 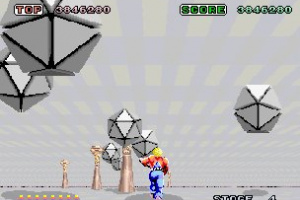 i just bought it and beat it in about 20 minutes. 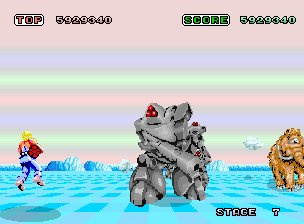 still kinda fun and probably the best version but they really did their fans/customers a disservice by releasing 3 versions, with the best one getting released last. it's not cool to bilk us like that. 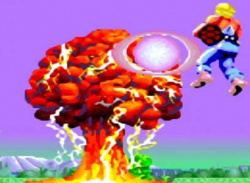 weren't users also able to rate games out of 10 (along with the official reviewer)? when did this change...or can we still officially rate it but i'm missing where we can do this? 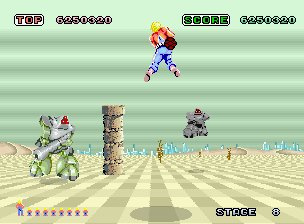 well, being a big fan of the space harrier arcade game (and even the home version) from when i was a kid, i'd probably grade this a 6 or 7 out of 10...i guess that's a 6.5 then =) this is the best version but it's $8 and beatable in a very short period of time. 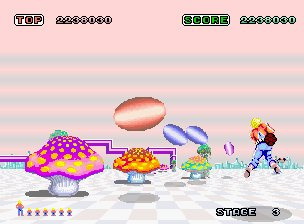 if you like SH from back in the day and don't have a version yet, you might want to give this a try. 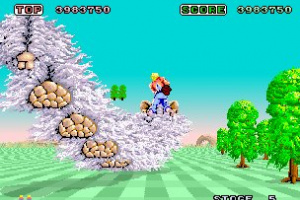 I played this game on Sonic's Ultimate Genesis collection quite a bit. 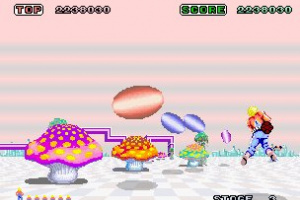 Its pretty good and I like the trippy visuals, but I wouldn't spend $8 on this game alone.